During WWII some 50 000 German soldiers were lost on the Finnish front. Most of the soldiers fell in the Soviet Union. The situation through most of WWII was that Finland and Germany were allies. There are two cemeteries in Finland for German soldiers. One in Helsinki, and one outside Rovaniemi, in Norvajärvi. We wanted to visit some of the track visitor points. Ms. Marja Jalkanen was again our personal guide. For many it is a difficult topic, but as time moves, we are able to talk about the dreadful WWII. On this very day, the weather was surperb. In the distant, we could hear fighter planes of the Finnish Air Force taking off and landing at the airport. Omen-like, it was like a war experience. 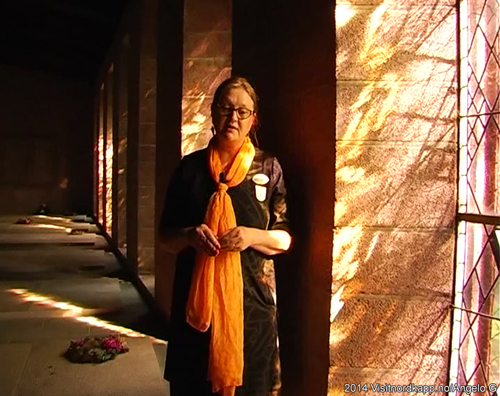 We had planned to film a little guided tour of the cemetery. We waited for the sound waves of the Hornets to pause, and managed to clip some moving pictures in between the rumbling fighter jets. The cemetery is set by the lake, Norvajärvi. The mausoleum rooms the remains of 3 000 German soldiers. Underneath eight large panels of limestone, the remains of identified soldiers are resting. 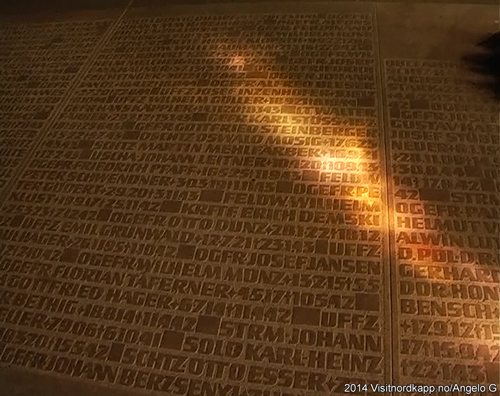 Their names and other pertinent information are engraved on top of the resting place. Not all soldiers have been identified. 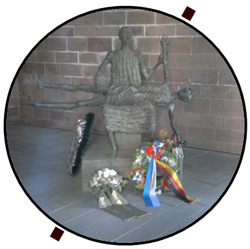 In the entrance of the mausoleum is the “Mother and Son” sculpture made by Ms. Ursula Querner (1921 – 69). Funeral sprays from a German tour group had been laid down by the sculpture. As we visited the cemetery, we were accompanied by two German travelers. The cemetery is an important stop for Germans. In general, it is difficult for German relatives to pay their respect to fallen German soldiers fighting on the Finnish front. Most of the German soldiers who succumbed are resting in Russia, and these cemeteries are less accessible. (In honour of those war cemeteries which our love cannot reach, may the peace of the Lord be with them). The soldiers resting in Norvajärvi have been moved from many places on the Finnish front. The work started in late 1950s and continued in early 1960s. In August 1963, the Norvajärvi cemetery was opened. Fallen soldiers are added to the cemetery even today. The cemetery is more a monument of lifeless, destructive, and sealed off ideas. The monolithic mausoleum designed by architect Mr. Otto Kindt (1909 – 2006) is skewed squarely as if it is not a building at all. It is a dark resting place. However, it is for fallen sons. The mausoleum in Norvajärvi rooms the remains of 3 000 German soldiers.